Special deal for 2018! $69 per person weekdays and $80 per person weekends. The Upper Chili Bar section is a fun Class 3 run with over 10 major rapids. Its course will take you through the small mining town of Coloma, where James Marshall first discovered gold at Sutters Mill and changed the course of California history. Calm sections are interspersed with rapids and the excitement comes to a head towards the end of this 8 mile run with a major rapid known as "Troublemaker". This river is excellent for either the veteran or novice. The flows on the South Fork American River are the most dependable in the state, with guaranteed recreational releases for the next 50 years. If you are looking to try your first rafting trip, or if you are a rafting pro, you can't go wrong with the Chili Bar section of the South Fork American. A complimentary chili dog lunch is served after the rafting portion of the trip. 10:00AM - Trip check in begins at Chili Bar Put In. Simply tell the parking attendant that you are rafting with Beyond Limits, and you will be directed to our parking area. You may be charged a $3.00 parking fee on certain days. Please have your river attire on when you arrive as there are no dressing rooms at our meeting area, and only Porta Potties are available to use. 10:15AM - After all participants have checked in, we will fit you for lifejackets and other river gear, as needed. We do not recommend that you bring valuable items with you on the trip. You may bring your wallets, car keys, and cell phones to place in dry boxes which will be transported to our take-out and available for you to pick up during lunch. 10:20AM - Our trip leader will give a river orientation and safety talk. Paddling techniques and helpful rafting tips are the topics of discussion. When everyone is up to speed on trip safety, you'll board the rafts and head downstream with your guide. The action starts right away on the Upper section of the South Fork. Within 1 mile, we'll be running a long, technical rapid known as "Meatgrinder". After this, the rapids come in quick succession with "Racehorse Bend" and "Triple Threat" providing the thrills. 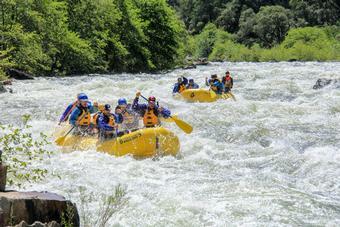 The last Big Rapid of the trip is the grand daddy of them all... "Troublemaker". Regarded by many as the highlight of the trip, "Troublemaker" is your chance for excitement, so make sure you are smiling through this rapid for some great photo opportunities! 1:00PM - We arrive back at River Park Resort where a BBQ chili dog lunch will be served. At the resort, you may view and purchase your fun rafting photos. Cold beer, wine and other beverages are available for purchase in our river store and outdoor patio bar. Enjoy the setting, relax and share your stories about your excellent rafting trip! 1:30PM - Our shuttle bus will depart to take you back to your cars. This ride takes about 30 minutes. 2:00PM - Arrive back to your car at Chili Bar Put In, and have a safe drive home! Take US Highway 50 East into Placerville, CA. At the stoplight, turn LEFT onto Spring Street. Continue to the first stop sign, and turn LEFT onto CA Highway 49 North. Continue for 0.6 miles on CA-49N, and veer RIGHT onto CA Highway 193 West. There will be a sign to Georgetown. Stay on the steep and windy CA-193W for 2.3 miles until you cross the bridge over the American River, and turn LEFT onto Chili Bar Ct/Chili Bar Ln. Take US Highway 50 West into Placerville, CA. At the stoplight, turn RIGHT onto Spring Street. Due to higher water levels this summer, we recommend all participants have basic swimming abilities. If you are not a strong swimmer, consider booking a trip in mid to later August, when water levels will be lower again. Please do not bring pets or valuable items. We will provide a dry box for your wallets, car keys and cell phones.